Everyone loves Mexican food so why not throw a Mexican themed party. We can't help you cook, but we can provide the great Mexican fiesta decorations! Start off decorating with a Festive Fiesta Giant Party Banner hanging outside to alert your guests that the Fiesta is occurring at your house. Once your guests enter make sure they are greeted with a margarita in their hand. You can't decorate for a Fiesta wrong. 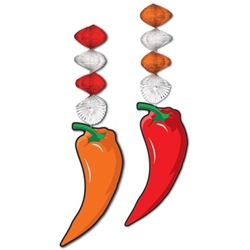 So pick out your favorite fiesta party supplies and hang them up around your venue. The Fiesta String Lights are very popular for a fiesta celebration. With these lights you can party all night long once they are hanging up! These decorations come in traditional Mexican colors like red, green, and white. We also have the very popular Tissue Chili Pepper. We also have fun streamers and cutouts that you can hang up on your walls or from ceilings. Take your party south of the border with our fiesta decorations! We have all the Spanish inspired decorations you will need to decorate your back yard or event space with. Whether you want to plan a fiesta party with a Mexican theme and focus on Mexican colors or if you want to have a Spanish feel with colors like red, yellow and orange we've got you covered.For a more traditional red,white and green fiesta we have plenty of decorations for you. Use the Rayon Mexican Flags as party favors for all of your guests. Accent with some chilli pepper and sombreros. If you are looking for a more colorful fiesta we have the perfect affordable decorations for you. The Fiesta Window Clings will look great on all of your windows that the guests can see even before they enter. For more fiesta decorations, hang the Jumbo Margarita Balloon by the drink table so guests can easily find the best part of the party! Just have fun with our inexpensive fiesta decorations and your party will be a hit!